Living healthy and staying fit isn’t a walk in the park. If you want to get rock hard abs and brute physical strength, it requires more than just eating right and going to the gym. Many people nowadays see the importance of living a healthy lifestyle and being fit, but that’s easier said than done. Many people step up to the plate and are up for the challenge. So you want to know the secret to living a healthy and fit lifestyle? According to one of the ambassadors of this year’s R U Tough Enough?, Arnold Aninion, the secret to success in fitness is being tough. This is because toughness is more than a fad but it is a way of life, he adds. Being physically strong alone doesn’t do the trick anymore; the mental aspect of toughness is needed in being successful in any aspect of life. You will need to have the discipline and strength to be able to achieve and live with this kind of lifestyle. Eating healthy right and exercising everyday is the easy part, but it’s the discipline and your drive to do it long term that makes it difficult. Arnold is a trusted fitness trainer of different famous celebrities like Solenn Heussaff, Anne Curtis and Isabelle Daza. But his biggest fitness story to date is his celebrity transformation of Raymond Gutierrez. In just three months he was able to coach and guide Raymond to lose a whopping 22 kilograms. According to Raymond, it was an experience he will never forget. He said it wasn’t just a physical battle; it was also a battle of the mind. It wasn’t always a smooth road for Raymond’s transformation; there were a lot of roadblocks and temptations thrown at him during that time. Arnold recalls Raymond slowing down during the first month. He said that Raymond was even in doubt that he was ever going to lose weight. Arnold remembers telling him “The best thing you could do right now is focus on the journey and learn from it.” Raymond gladly followed and a few months later, boom! 22 kilos, gone! So do you think you have what it takes to be tough like Arnold? Join #TeamArnold and the rest of the Men as they face off against the women of this year’s R U Tough Enough? 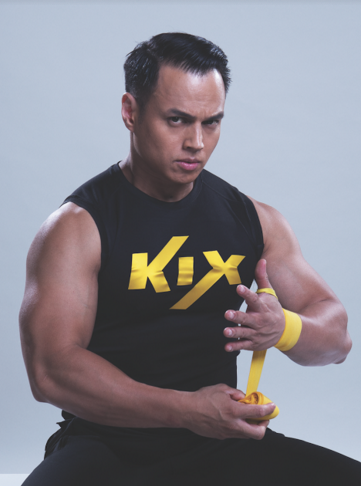 brought to you by KIX, Asia’s ultimate destination for action entertainment. Hurry and sign up now because applications will soon be closed! KIX is available on (Cablelink Ch. 31, Cignal TV Ch. 264, Destiny Cable Ch. 10, Gsat Ch. 117, and SKYcable SD Ch. 63 and HD Ch. 242). For more information, you can log on to www.KIX-TV.com.